A yellow jacket colony can number in the thousands – Call us for removal right away! There are many stinging insects in this world that would not be of much concern if they only appeared once in a while and in small numbers. Unfortunately, yellow jackets pose a real nuisance because they are more inclined to form large communal nests. Yellow jacket nests may contain thousands of individuals. If you have discovered yellow jackets near your Lakeland, Florida home or business, yellow jacket removal isn’t a situation you want to take on by yourself. 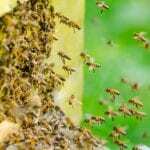 Call the stinging insects specialists at Florida Bee Removal instead. We can take care of your yellow jacket removal needs. Yellow jackets are the most abundant and defensive members of the wasp family. Yellow jackets often live in underground nests, so just walking near them or mowing the lawn can trigger an attack. Yellow jacket nests may also be discovered in walls, palm trees, wrapped up in carpet, in furniture, or, even in the bed of a pickup truck. Yellow jacket stings are quite painful and can be dangerous, even deadly, if you have a strong allergic reaction. One of the reasons it hurts so much is that they often bite and sting at the same time. Since they seldom lose their stinger, as bees do, they can sting repeatedly. Combine that with dozens or more attacking at once, and you have a real problem. Avoid the potential disaster by calling us to set a time for yellow jacket removal. We are available 24/7 to resolve your stinging insect situation; we are passionate about protecting your property and the people on it.